THE AIRCRAFT THAT RAISES THE TURBOPROP CATEGORY TO ANOTHER LEVEL. The model incorporates everything that can be expected of a large aircraft: efficiency, power, economy, and comfort. It was no coincidence, it was born to be the new leader in the category. The Denali is a complete aircraft, capable of serving you with perfection whatever your mission may be. Its sturdy landing gear allows the aircraft to land and take off on uneven and unpaved runways and thus operate in places where others can not. The model can also be configured in various ways, prioritizing passenger comfort or space to accommodate cargo and luggage. In addition, it has a wide rear door, which facilitates the loading and unloading of large volumes. The model features an advanced 1,240 shp GE turboprop engine with FADEC control, 4,000 hours of overhaul range and technologies that provide a reduction of up to 15% in fuel consumption, resulting in the lowest operating cost in the category. Equipped with Garmin G3000 avionics, already traditional in the Citation line of jets, the Denali boasts a sophisticated flight deck, with the latest in touchscreen avionics. 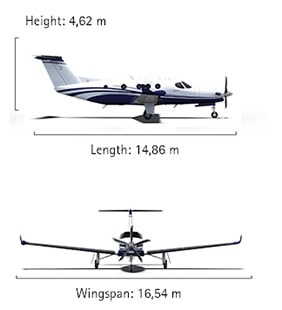 The model also features a new McCauley propeller with composite material and five blades, which improves efficiency and the aircraft’s rate of ascent. In its design, the Denali prioritizes the best in aerodynamics, without compromising a modern attractive appearance.